Purpose: To use the Copy from Requisition process to create a new PO using ctcLink. ctcLink Purchasing enables you to create a new purchase order by copying an existing contract, requisition, or PO. Copying enables you to save redundant data entry time. At the Add/Update POs screen, you can elect to Find an Existing Value or Add a New Value. If you already have a PO you want to update, enter the Business Unit and PO ID. Make sure the PO has not already been approved. Select Search and select your appropriate row. This should take you to the Maintain Purchase Order page. 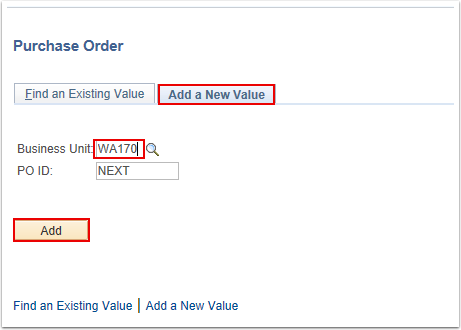 You can skip through the next section and go directly to instructions pertaining to the Maintain Purchase Order page. In this QRG, we will use the Add a New Value tab. Enter Business Unit. The PO ID field will be auto-populated with NEXT for the new PO are you creating. The value in the PO Date field is the current system date by default. You can override the purchase order date. This appears on the purchase order and is the date used for price calculation if the price date is defined as the purchase order date. Use the Maintain Purchase Order page to enter or change PO information online. Enter the desired information into the Supplier ID field. Select the Copy From field and choose Requisition. This will automatically take you to the Copy Purchase Order from Requisition page. When you copy from a requisition, you are sourcing the requisition onto the purchase order. The Copy From field on the previous page enables you to turn a requisition into a purchase order without going through sourcing. If you want to partially source, split source, or consolidate requisitions, use the Requisition Selection component. If a blanket purchase order is specified on the requisition line, it cannot be sourced to the purchase order here. In addition, the procurement card information will be copied to the new purchase order if all the requisitions selected are using the same procurement card information. If the information between the requisitions is not the same, the procurement card will be blank or the buyer's procurement card will become the default value. If a supplier card currently exists on the purchase order, it will not be overridden by the requisitions procurement card information. Enter the Supplier ID or the Requisition ID in the Requisition Selection Criteria section. Select the Search button. This populates the Select Requisition Lines section. 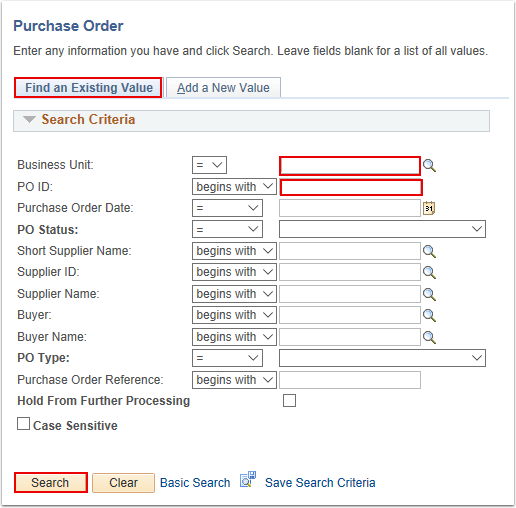 Select the relevant Requisition Line(s) from the search results. Select the Copy To PO button. Notice that the page displays the details of the items that you selected to copy. Also notice the fields that are auto-populated throughout the Purchase Order screen. Information that you would have otherwise had to enter manually. Notice that the system has automatically assigned the new PO ID if you were creating a new PO. Otherwise, it will update your existing PO. You have successfully created a PO by copying a requisition.